9.30am for 10am start until 5pm approx. Finish time may alter slightly. Please bring a covered two tier black dummy cake ( assembled) Size 5 "x 6" deep and 6" x 6" deep. They can be deeper but a min of 6 inch deep. Louise uses Massa. You can also used Renshaw before its just harder to handle. 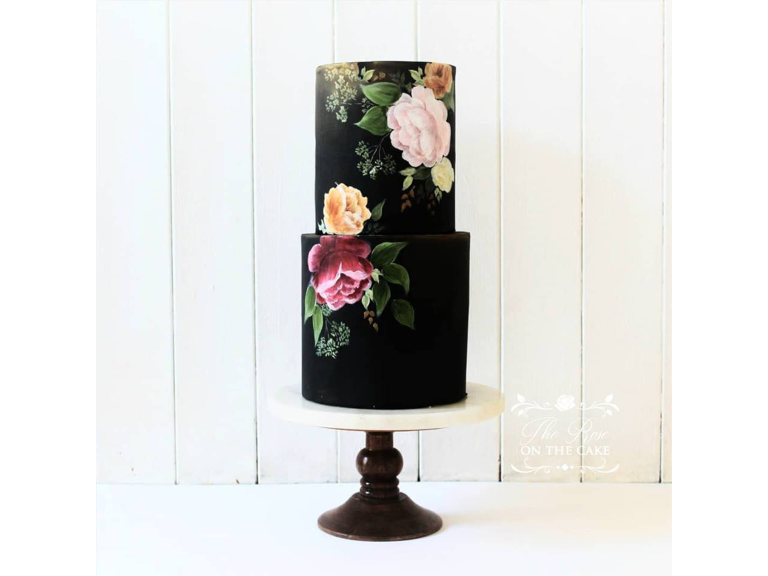 You will learn the technique of paint striking and bold colours onto a dark coloured fondant. Louise will demonstrate and give guidance on how to paint her roses in slightly different shapes and sizes. You will also learn briefly about colour mixing! Please remember to bring your covered cake dummies, assembled please. You may find it easier transporting it on a covered cake drum/board. If so we would recommend a black covered drum.